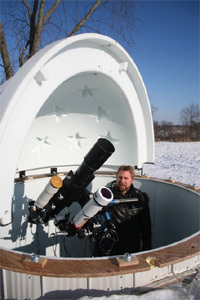 Hawk Repurposed My Solar Scope - SolarChat! I woke up this morning planning to take some shots of the active region on the solar limn, but when I looked out at my canvas-covered scope there was a Cooper's Hawk using it as a perch. The sky is cloudy so he got to keep his perch for now. That is so cool ! First one I see. Amazing images Dave. Beautiful hawk, Dave. That’s an expensive perch! Wow. If your AR shots turn out half as good as your bird pics you had a fantastic day!